Manuel pump to install Tyreseal in any vehicle. Holds pressure up to 70 psi.Made for 20 litre d..
Grade 1 Commercial used by Commercial vehicles, vans, caravans, motorcycles, lorries, and any v..
Grade 1 Domestic used by domestic vehicles, cars, vans, caravans, motorcycles, lorries, and any vehi..
Off road product is used in building site vehicles such as dumpers, trucks, JCB's, and all heavy mac.. 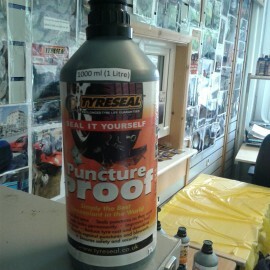 Extreme Tyre sealant is used for On Road and Off Road vehicles.For commercial vehicles only.Especial.. This product is for tubed tyres.Mainly for bicycles, motorcycles, wheelbarrows, mobility scooters, e..